Lest you think I can't spell I thought I'd remind folks that the title I use for this post each month is my way of updating you on the file of books I've been reading. It's just my way with words, or non words, if you will. I mean, of korse I cahn spell. Of course, the title might have come from the picture in this post. Then, though, it would have been Biliopile. But I digress. Anyhoo, I started off the month with a lengthy look at rock promotor Bill Graham. As a music lover I found this book fascinating, full of anecdotes of his relations with the major rock acts of the day. As the owner of the Fillmore East and West he saw them all. I also enjoyed learning a little bit about the man himself. The rest of February was taken up with an escape to Narnia. C.S. Lewis wrote the Chronicles of Narnia in the 1950s. I'd never read them as a child and until now my only reference point was the 2005 movie The Lion, The Witch and The Wardrobe. I loved them, all seven of them. I can see how their escapism would appeal to pre-teens...and old men such as myself! So the eight books this month plus the six I read in January brings me to 14 books so far this year. 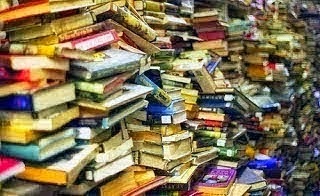 I've set a goal of 75 books this year and I'm sure I can reach it. And in case you think all I do is read, this month I discovered a raft of British TV shows on On Demand. Five Days, Utopia, Life's Too Short and The Hour were among the series I got through. I enjoyed them all. Good Gawwwd, man... You put me to shame. I knew Bill Graham, worked in the recording office downstairs from his. Don't recall a day he was not screaming about something. Crazy man, but the godfather of the SF music scene. Billy Graham was a rock promoter?! Hmmm. The things you learn... ;) I read The Chronicles of Narnia as a child, at least I think I did or most of them anyway, but I know Kim tried them within the last few years and couldn't get into them. Maybe I'll have to try/retry them. Why I say I'm not sure if I remember is because only recently did I learn that I never had read To Kill A Mockingbird. I thought I had but then went to look at the book and realized it didn't look familiar. I had seen the movie but never read the book, but the movie was pretty faithful to the book, with the exception of the n-word being used, and both were great in my opinion. With The Chronicles of Narnia, I know I read several of them and maybe even have read the last one. I just don't remember if I read all of them. I do know I read The Lord of the Rings...several times in my teens, almost every summer for a few summers. It never ceases to amaze me the contacts you've made, Jayne. Amazing. A shouter. Yeah, that's the reputation the man had. The other Bill Graham, dummy. You know, Bryan, as I get older I find I have more time on my hands to connect with things I may have missed out on earlier in life be it children's literature, 60s and 70s music, classic bestsellers and what have you. Part of the reason I enjoyed Chronicles is it helped me utilize my inner child. Kinda neat, eh? Scared the be-jeezus out of everyone. And yes, it would seem that I've led many lives. No wonder I'm so tired. I'm impressed. You deserve at least a nap. I don't think I've ever read a fantasy book in my entire life. My mom stopped reading to the oldest of us when we were young so we were pretty much on our own. I read the Little Golden Books and skipped right over everything else in favor of mysteries: Bobbsey Twins, a bit of Nancy Drew but more of the Hardy Boys, then headed straight for Mark Twain, Ellery Queen's & Alfred Hitchcock's short story magazines that kicked me into high gear with Rex Stout, Ed McBain, and the rest. I was a big fan of Classic comics as a kid. Wasn't a big reader but watched stuff like Spin and Marty and other Disney fare. I've read several Rex Stout novels. Thanks for the reminder. I'd like to revisit. The Hour was brilliant. Kind of like The Newsroom but set in post-war Britain with soviet spy overtones. I love British stuff. The original House of Cards was good too.